Need a little spice in your life? musimelange will not disappoint! Within the alluring walls of the showroom inside the M building you will experience a pastiche of seasoning for all senses. On Monday March 4, 2013 at 7:30 treat yourself to an experience that is sure to spice up the rest of your workweek! 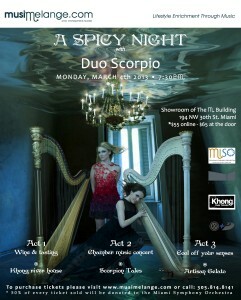 Act 2: After performing J Rodrigo’s Concierto de Aranjuez with The Miami Symphony Orchestra, harpist Kristi Shade will present to musimelange audience, her harp duo with Kathryn Andrews**: ”Duo Scorpio,” a New York City based harp duo aimed at expanding the harp duo repertoire and genre. Kristi and Kathryn will be performing works from their latest album including the recent collaboration “Scorpion Tales” written for the duo in 2012 by Robert Paterson. It’s true spice for the ears! Act 3: Cool your heated senses with artisan gelato from Dolci Peccati***, while you enjoy the company of the beautiful and talented Duo Scorpio.